Shandong cuisine has gained, under the influence of Confucianism, a reputation for emphasising flavour, striving for harmony and retaining integrity. “Mike, come and try our Shandong scallion wrapped with pancake.” On his first visit to his classmate Li Zhongfeng’s house, Mike Crass, a young American who is studying Chinese Language and Literature in Shandong, was impressed by the hospitality of Li’s father. Mike accepted the pancake and took a bite with great interest, only to find that it was so chewy that he didn’t bite through. Li’s father is right. As the saying goes, “Shandong cuisine is not genuine without scallions”. From this we can see the important role scallions play in Shandong cuisine. 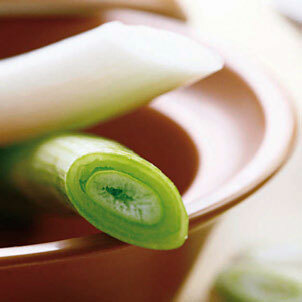 Scallions can enhance sea cucumber’s flavour while eliminating its fishy smell. Li’s father, from Zhangqiu, Shandong, is tall and strong in appearance, and frank and outgoing by nature. Scallions produced in Zhangqiu are also quite tall and strong, with the whole plant reaching two meters in height, and their white stalks can reach almost one meter in length. Unlike chillies used in Sichuan and Hunan cuisines, which are scentless but extremely spicy, scallions have a strong smell but they are quite mild. The Compendium of Materia Medica even calls them “peacemaker herbs”. Chefs of Shandong cuisine are skilled in seasoning with scallions. No matter if it is stir-frying, stewing, boiling, braising or baking, scallions are always needed. Shandong people are honest and frank as scallions are tall and straight, and pure and white, showing their plain and simple natures. When a large dish of sautéed sea cucumber with scallions was served, Li’s father told Mike, “Sea cucumber is soft and tender, and scallions enhance its flavour while eliminating its fishy smell; the two ingredients, when added together, make a perfect and nutritious dish.” After the dishes were served, Mike noticed that the braised pork balls in gravy were covered with finely diced scallions, and eggs fried with scallions smelt awesome. “Shandong cuisine is truly the cuisine of scallions!” he said with admiration. “Thriving at water’s edge and moving with the flow of water” is a major characteristic of Chinese cuisine. Guangdong cuisine was born on the banks of the Zhujiang River, Sichuan cuisine developed near the upper reaches of the Yangtze River and Huaiyang cuisine emerged along the middle and lower reaches of the Yangtze River, and the Yellow River gave birth to Shandong cuisine. Shandong Province is located in the lower reaches of the Yellow River, with a mild and pleasant climate. With rolling hills, magnificent mountains, vast lakes and the fertile Yellow River Delta, the province boasts an abundant source of foods. During the meal, Li’s mother brought up a bowl of white creamy soup from the kitchen, which was glistening with a green-white vegetable. Mike took a sip and the aroma lingered in his mouth, imparting a faint taste of milk. Li’s father said, “It is called milky soup of cattail, a Shandong specialty. Cattails only grow in the famous Daming Lake in the city of Jinan and it is rarely available in the markets. Although named milky soup, the soup is made without a drop of milk, but was boiled for a long time to give its creamy white colour. Jinan, the capital of Shandong Province, has long been known as “a city of springs”. 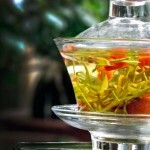 Its high quality spring water ensures a delicate soup, so soups are deemed as the essence and soul of Jinan cuisine. The soups of Jinan cuisine are classified into clear or creamy varieties. Admittedly, creamy soup boiled over a strong fire is tasty, but the flavour of clear soup has stood the test of time. With old chicken, plump duck and pig knuckles as main ingredients, a long-time gentle heat can produce the crystal-clear soup that has been in favour since ancient times. Qi Min Yao Shu (Important Arts for People’s Welfare), written by an agronomist of the Northern Wei Dynasty (AD 368-534) named Jia Sixie from Shouguang of Shandong, contains a soup recipe from 1,400 years ago: “Break cow and sheep bones, boil thoroughly and pour out the soup, then skim off any scum and allow the sediments to settle so as to get a clear soup.” In accordance with regional differences, Shandong cuisine can be further subdivided into Jinan cuisine, Jiaodong cuisine and Kongfu cuisine. The cuisine features light seasoning attracts people with its natural freshness. 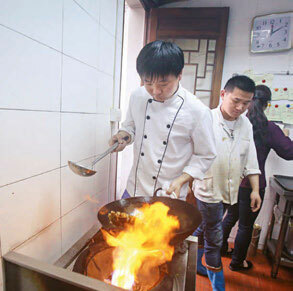 Jiaodong chefs, such as Braised Sea Snails in Brown Sauce, Deep Fried Oysters, Sautéed Razor Clams with Garlic Chives, and Egg White Fried with Clam.  Jiaodong cuisine has its origins in Fushan, Yantai City, Shandong Province. 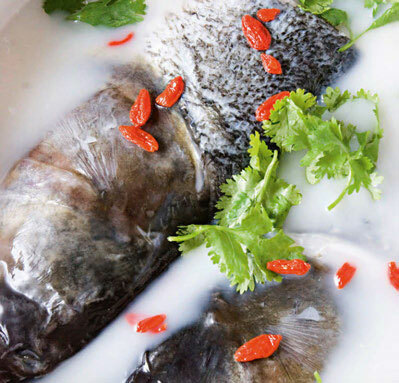 With the Bohai Sea to its west and the Yellow Sea to its north, Fushan has a great variety of marine produce, making it “the homeland of Shandong chefs”. According to the statistics, there are over 10,000 overseas Chinese of Fushan origin from 3,000 households, and 90% of them engage in the catering business. 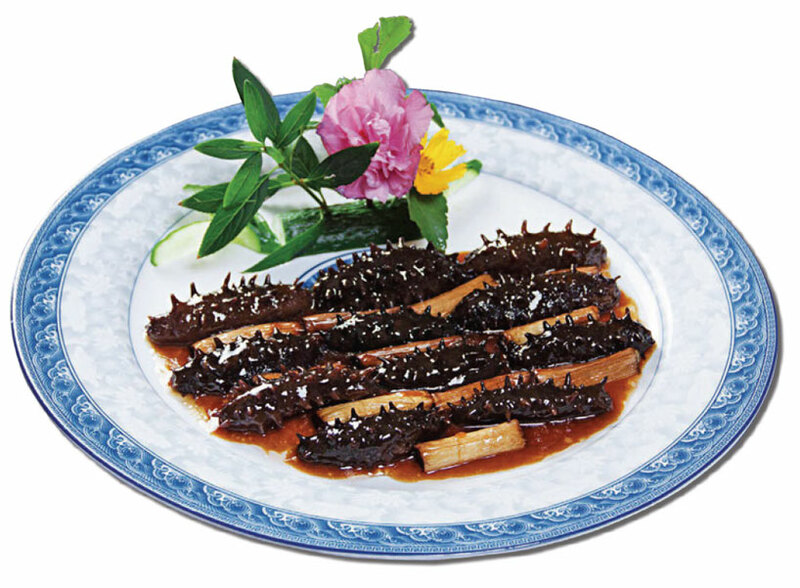 Jiaodong cuisine features light seasoning and attracts people with its natural freshness. It is said that in the past when MSG had not been around, Fushan chefs made use of local ingredients and used the powder of Hai Changzi (urechis unicinctus) to enhance the flavour of the dishes. 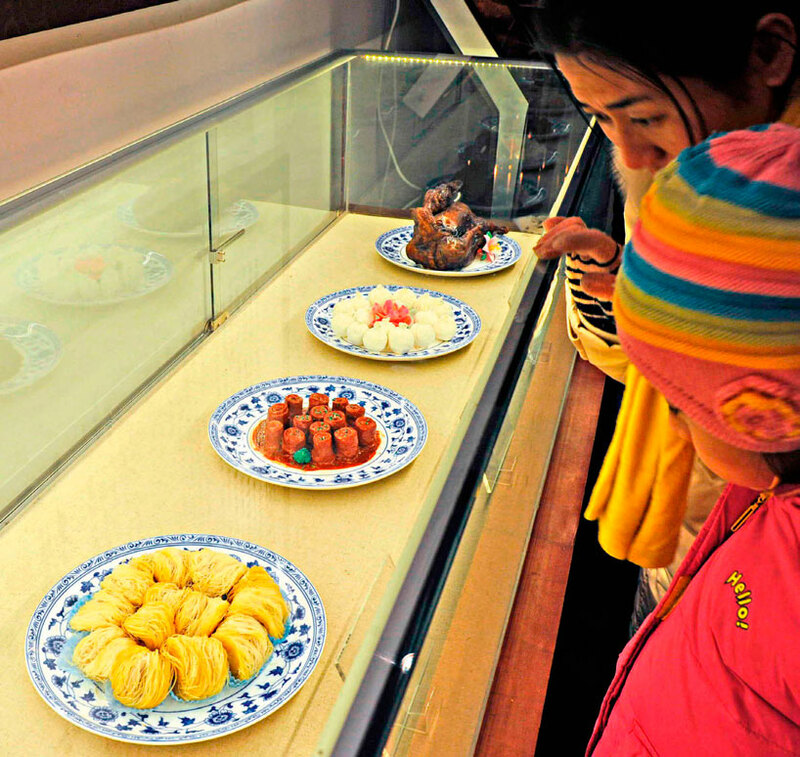 The cuisine of Kongfu, literally ‘the dishes of the Confucian Mansion’, spares no effort in striving for culinary refinement and attaches great importance to the tableware, exemplifying the saying that “fine food is not as important as fine tableware.” The combination and setting of the dishes are also full of implied meaning. 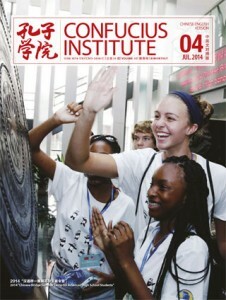 The social ideal of peace and harmony, a pursuit of Confucianism, is reflected in the philosophy of Kongfu cuisine. There is a famous dish in Kongfu cuisine called Zhu Zi Gong Shi ‘pupils paying tributes to their master”. In the centre of the dish are slices of dried bamboo shoots symbolising the pupils of Confucius because the two characters zhu zi ‘pupils’ are homophonous with the word zhuzi ‘bamboo’; while around the dried bamboo shoots are slices of smoked ham and fresh bamboo shoots wrapped in Chinese leaves, which symbolise the tributes the pupils brought to Confucius. 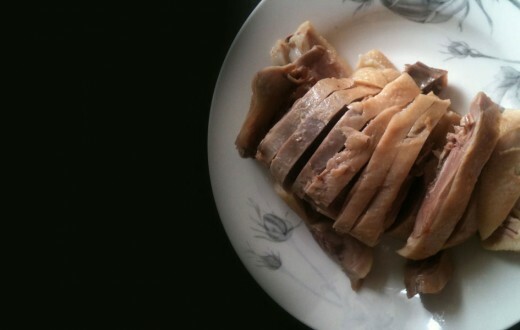 It was said that if a student wanted to study under Confucius, he would present Confucius with a piece of ham at their first meeting, which explains the ham in the dish. The names of Kongfu cuisines have such profound cultural connotations that you can learn much about Chinese culture from them. For example, Yi Luan Fu Shuang Feng ‘out of one incubated egg emerge two phoenixes’, Shi Li Yinxing ‘bowing ginkgo’, Yangguan San Die ‘bidding farewell thrice to a friend’, Bai Yu Wu Xia ‘flawless white jade’, Huang Peng Ying Chun ‘a yellow roc greeting spring’, Daizi Shang Chao ‘going to the imperial court with one’s son’; and Huai Bao Li ‘holding a carp with two arms’, all sounding so poetic. 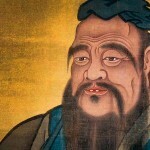 In Confucianism, there are specific etiquettes on how to treat guests, hold banquets and consume food. For example, a guest’s status dictates where he sits, and delicacies should be tasted by elders first. These etiquettes, which have widely influenced China’s dining culture, are especially obvious in Shandong cuisine. These dining etiquettes exemplify the Chinese people’s idea of harmony — honesty and gentleness, tolerance and generosity, the unity of man and food. 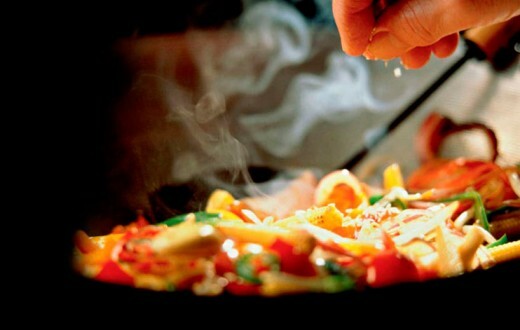 Apart from etiquette, the variety of Shandong dishes and their methods of cooking also embody harmony. Take the word geng ‘thick soup’ for example. In ancient times, geng generally referred to a juicy meat stew. People used to cook meat in a big pot and would add green vegetables and condiments to regulate the five flavours — spiciness, sourness, sweetness, saltiness and the bitterness, thus producing juicy meats. According to Shuo Wen Jie Zi ‘simple characters explained and compound characters analysed’, a Chinese dictionary compiled by Xu Shen 2,000 years ago, “five flavours need to be harmonised to make a geng.” Chinese people not only divided flavours into five types and invented the system of five flavours, but also developed the concepts of “five cereals”, “five meats”, “five vegetables” and “five fruits”. Take stir-frying as another example. This style of cooking was first recorded in Qi Min Yao Shu (Important Arts for People’s Welfare) as mentioned. The author Jia Sixie was not only a great agronomist, but also a great chef of Shandong cuisine, who comprehensively summarised the cooking skills of Shandong cuisine and even recorded the recipes for many famous dishes such as Roast Duck and Roast Suckling Pig, which reflected the superb culinary skills and distinct characteristics of Shandong cuisine. His statue sits in Jinan’s Quancheng Square so that people may pay homage to him. 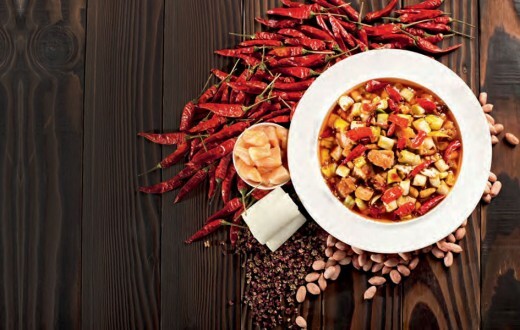 The invention of stirfried dishes brought about nutritional balance in meals and, since the Ming and Qing Dynasties (1368-1912), stir-fried dishes have become a daily staple for the ordinary people of Shandong. People cut up various ingredients, big or small, meat or otherwise, soft or hard, then heat up and season all of them together. Under the influence of Confucianism, Shandong cuisine has gained a reputation for emphasising flavour, striving for harmony and retaining integrity. Some people say that when they think of Shandong cuisine, the word he ‘harmony’ always comes to mind with the image of people eating large chunks of meat and drinking big bowls of wine, giving people a sense of broad-minded heroism.